Her lawyer is a real gem too! Jesus Harold Christ On Rubber Crutches! That was more painful than being decapitated! Kathy Griffin and her attorney Linda Bloom really out-did themselves. It is hard to see how there will ever be a press conference more self-indulgent, narcissistic, ignorant, phony, and stupid than the one Americans were subjected to yesterday. Attorney Linda Bloom opened by claiming President Trump has harmed people needing help paying for their heat, denied birth control to women in need, dumped 24 million people from their insurance, let us burn up in the sun by leaving the Paris Climate Accord, made us the laughingstock of the world, forced the cancellation of Sense8, caused more socks to get lost in the dryer, and made you listen to that awful song you can’t get out of your head. Well, I made up those last three. I think. But the underlying message in Bloom’s diatribe was pretty obvious. Trump is a very bad man, and so what Kathy Griffin did wasn’t that terrible. Statement that you have to be brain dead to believe: “I’m Kathy Griffin. I’m really nervous right now. I’ve never done a press conference.” A woman who routinely performs in front of thousands of people is nervous at a press conference? That made my month! Bloom is well practiced in the art of deceit. “The message is clear: criticize the president, lose your job,” she claimed. I’m just guessing here, but I’ll bet 99.99 percent of the people who have criticized Trump have not lost their jobs. The reason is simple: no one else’s speech glorified a simulated decapitation of a sitting American president. 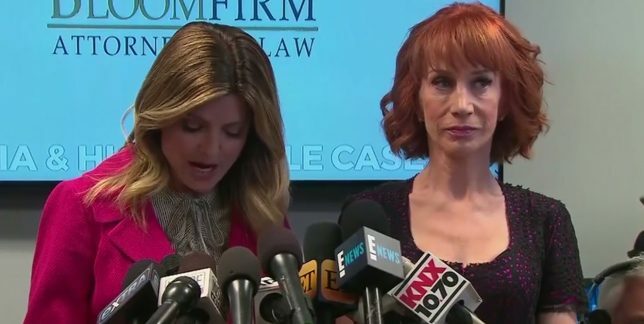 Bloom thinks this will elicit sympathy for Griffin: “As a result of the first family’s bullying of her, and of those she does business with, Kathy has been vilified, she’s been receiving death threats…been fired from multiple jobs, and had multiple events canceled.” Welcome to the club, babes! That is how the political left treats people who get in their crosshairs. See Brendan Eich, for example. Every time someone faces consequences for saying something stupid and/or disgusting, the political left tries to make it into a free-speech issue. Bloom is no exception: “Whether or not you get or like her artistic expression, Kathy Griffin has the right to publicly ridicule the president.” Nice try, counselor. But free speech rights only protect you from government retaliation, not from other consequences such as ridicule and social ostracism. Freedom of speech does not mean that you won’t lose your audience or your endorsements or your job. Just ask Taffy Gessling. Finally, if you listen to the press conference, you will lose track of the number of times Griffin says she has been fighting male oppression all of her life. Yes, she’s so oppressed that she only has an estimated net worth of $20 million. The fact is Griffin is getting everything she deserves with the exception of the death threats. If she had an ounce of self-respect, she wouldn’t play the victim card. Pathetic.